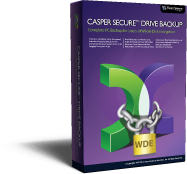 "Possibly the most easy-to-use automated backup program ever released." NEW! Casper™ 10 NEW VERSION! New Version 10 Now Available! Designed exclusively for Windows™, Casper makes it a snap to keep a complete image file backup or instantly-bootable backup replacement drive for your system. When disaster strikes, you can restore your backup image or simply boot and run your computer directly from your bootable backup and be up and running again immediately. It's that easy! Casper creates a complete copy of your system hard disk, including the operating system, applications, settings, and all of your data. Easy-to-use wizards quickly guide you through the process step-by-step. 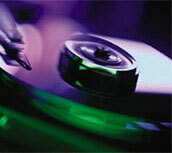 Safely test-boot your system from a backup at any time for added assurance! 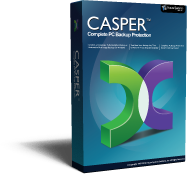 Casper Secure Drive Backup is the only backup and recovery solution specifically designed for users of Symantec Drive Encryption (formerly PGP WDE) and Windows BitLocker Drive Encryption. With one click, Casper Secure creates a complete, fully encrypted backup of your encrypted Windows system drive in its original encrypted state without ever leaving Windows. When disaster strikes, you can restore your backup to its original encrypted state or simply boot and run your computer directly from your encrypted bootable backup and be up and running again immediately. It's that easy! Creates a complete, fully-encrypted copy of your PGP Whole Disk Encrypted system drive, including the operating system, applications, settings, and all of your data. Makes upgrading a whole disk encrypted system drive to a larger capacity drive extraordinarily easy without requiring a laborious and time consuming backup, restore, and re-encryption process. Creates a fully bootable copy of a whole disk encrypted Windows system drive that will even boot and run directly from an external USB drive. With Casper Secure, I have a one-step, complete solution. Casper Secure backs up everything and the backup maintains my original PGP whole disk encryption so that I remain 100% compliant with corporate security policies. "...look no further than Casper"